It’s the time of the year when the cactuses of the Sonoran desert bloom, and while not exactly a riot of color, there’s something very special about seeing the rugged and blandly colored plants extrude fragile flowers. 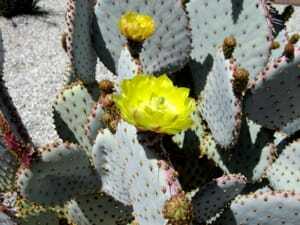 Prickly Pear in bloom. Click for larger view. Mmm … buttery. Click for larger view. 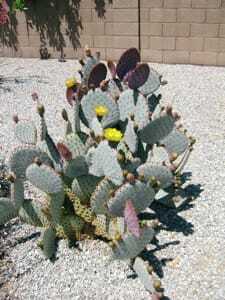 According to the always interesting Wikipedia, the almost-invisible hairy spines on genus Opuntia are called glochids. They’re what you spend quite a lot of time removing from your skin with a pair of tweezers if you get too close to one of these bad boys.